Wash Care Labels carry the important message to ensure that your customers follow the proper fabric care instruction. Our custom-made woven labels are colour fastness, great durability to laundry washing. The labels also have high-definition weaving resolution, good care symbols images, and vivid colour designs. Printed satin labels are the cheaper alternative option. We can do from 100 labels production. We offer traditional rotary printing and screen silk printing services. Lead-time for rotary printing is 4 days, and 12 days for screen silk printing production. 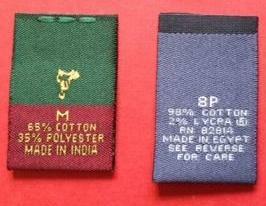 Cotton labels are very popular clothing labels to use for children’s clothes and ethical fashion brands. They are lightweight fabric labels and 100 % natural cotton fibres. This is the most comfortable clothing labels against skin. You can choose your favourite cotton fabric: twill, taffeta, plain taffeta, herringbone, canvas, and grosgrain cotton fabric. We supply many of the UK and Europe textiles retails with woven brand name labels, care labels, and wash labels. Contact us on below email, to start manufacturing the bespoke woven fabric labels to ensure your textile products have correct care instruction. We offer low minimum quantity, and very competitive prices. And it is free UK delivery.